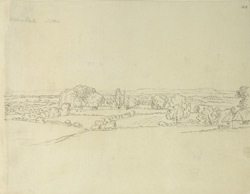 A distant outline view in ink of Selston Hall. The hall was built by Timothy Pusey, a steward of Bess of Hardwick (influential courtier of Elizabeth I), in the late 15th or early 16th century. It was a fine example of Jacobean architecture, but the wings were demolished in about 1830. The rest of the house was demolished in the 1970s.